Responsive layout Adjusts optimally to the width of the browser it is viewed on. As a result, it looks awesome regardless if it’s a desktop computer, smartphone or tablet your visitors are using. 1200px wide Monitors constantly get wider nowadays, which is why Genteel gives you plenty of space for your content, with an initial width of 1200px on desktop – and as much as needed on mobile. Comes in your favourite color Five carefully selected, awesome color schemes to choose from: Turquoise/Red, Brown/Blue, Dark/Bright Purple, Green/Gold and Black/White. Just pick the one that fits your brand with a single click through the theme-settings. Full-width Slideshows Genteel is all about impressing your visitor/client with powerful imagery, which is why it comes with full-width slideshows both on the homepage as well as on product, service and showcase presentation pages. And all of these are easily driven using the built-in intelligence supporting images, text and even full HTML. Testimonials Slideshow Why list just your products and services and not do the same for the words of your customers? 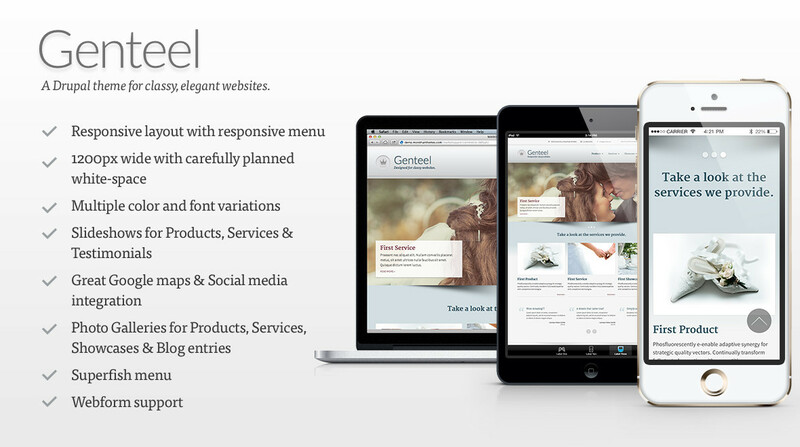 Genteel comes with a gorgeous, built-in slideshow for your customers’ testimonials. Great Google maps integration Making it easy for your visitor to locate your business on the map plays an ever-growing role nowadays, and Genteel does great in this direction. Multiple photos for your Products, Services, Showcases & Blog entries Show off your products, services, showcases and blog entries in all their glory. Responsive menu Genteel comes equipped with a plugin which transforms the Main menu of your site into a dropdown select list when viewed from a mobile device. And you can configure the behavior of this plugin through the theme settings. Superfish menus Genteel integrates with the Superfish module supporting gorgeous multi-level drop-down menus with smooth motion. Multiple font-schemes Select among tens of different font-schemes, with font-families for all tastes and corporate identities. Just pick the one that fits you with a couple of clicks from the theme settings.